Attorney Zak Muscovitch defended the owner of VMI.com, in a UDRP that stopped short of a Reverse Domain Name Hijacking finding. The valuable domain asset was registered in 1994, and an Arizona company, Vantage Mobility International LLC, asserted rights to the VMI mark. That mark, however, was registered 20 years after the domain’s registration, and not exclusively to the Complainant. Respondent argues that Complainant offers no evidence that it is commonly known by the VMI mark. Respondent claims that the VMI mark is an acronym that is widely used around the world. There are 17 VMI marks owned by third parties that are registered in the United States Patent and Trademark Office in connection with various kinds of goods or services. See Resp. Annex A. In addition, there are 8 companies in Arizona that use the VMI mark in their business name. See Resp. Annex C. A Google search for VMI shows that there are 12,400,000 results for VMI, with the Complainant nowhere to be found until the fifth page of results. Respondent claims rights or legitimate interests in the <vmi.com> domain name as Respondent registered the domain name as part of its legitimate and well-established business of investing in generic, descriptive and acronym domain names and, unrelated to the products and services offered by Complainant. Respondent purchased the name due to its inherent value as a three-letter domain name. Honorable Nelson A. Diaz, Chair, The Honourable Neil Anthony Brown QC and David H.Bernstein, Panelists decided that the domain should remain with the Respondent, as there is no bad faith in its registration or use. Complainant is Vantage Mobility International, LLC (“Complainant”), represented by Blake Atkinson of Fennemore Craig P.C., Arizona, USA. Respondent is Michael Bilde / Embrand (“Respondent”), represented by Zak Muscovitch of Muscovitch Law P.C., Canada. The domain name at issue is <vmi.com>, registered with NameSilo, LLC. The undersigned certify that they have acted independently and impartially and to the best of their knowledge have no known conflict in serving as Panelist in this proceeding. Honorable Nelson A. Diaz has been appointed as the Chair of the three-member Panel along with The Honourable Neil Anthony Brown QC and David H. Bernstein as Panelists. Complainant submitted a Complaint to the Forum electronically on June 8, 2018; the Forum received payment on June 8, 2018. On June 12, 2018, NameSilo, LLC confirmed by e-mail to the Forum that the <vmi.com> domain name is registered with NameSilo, LLC and that Respondent is the current registrant of the name. NameSilo, LLC has verified that Respondent is bound by the NameSilo, LLC registration agreement and has thereby agreed to resolve domain disputes brought by third parties in accordance with ICANN’s Uniform Domain Name Dispute Resolution Policy (the “Policy”). On June 15, 2018, the Forum served the Complaint and all Annexes, including a Written Notice of the Complaint, setting a deadline of July 9, 2018 by which Respondent could file a Response to the Complaint, via e-mail to all entities and persons listed on Respondent’s registration as technical, administrative, and billing contacts, and to postmaster@vmi.com. Also on June 15, 2018, the Written Notice of the Complaint, notifying Respondent of the e-mail addresses served and the deadline for a Response, was transmitted to Respondent via post and fax, to all entities and persons listed on Respondent’s registration as technical, administrative and billing contacts. A timely Response was received and determined to be complete on July 9, 2018. On July 12, 2018 the FORUM received a timely Additional Submission on behalf of Complainant pursuant to the Forum’s Supplemental Rule #7. On July 16, 2018 the FORUM received a timely Additional Submission on behalf of Respondent pursuant to the Forum’s Supplemental Rule #7. On July 18, 2018, pursuant to Complainant’s request to have the dispute decided by a three-member Panel, the Forum appointed Honorable Nelson A. Diaz, Chair along with The Honourable Neil Anthony Brown QC and David H. Bernstein as Panelists. Having reviewed the communications records, the Administrative Panel (the “Panel”) finds that the Forum has discharged its responsibility under Paragraph 2(a) of the Rules for Uniform Domain Name Dispute Resolution Policy (the “Rules”) “to employ reasonably available means calculated to achieve actual notice to Respondent” through submission of Electronic and Written Notices, as defined in Rule 1 and Rule 2. Complainant, Vantage Mobility International LLC., is a manufacturer of wheelchair- accessible vehicles. Complainant uses the VMI mark to provide and market its goods and services. Complainant claims rights in the mark based on its registration with the United States Patent Office (“USPTO”) (e.g. Reg. No. 4,641,140, registered on Nov. 18, 2014). See Amend. Compl. Annex B. Respondent’s <vmi.com> is identical to Complainant’s VMI mark as it incorporates the mark in its entirety, merely adding the generic top level domain (“gTLD”) “.com”. Respondent does not have rights or legitimate interests in the <vmi.com> domain name. Respondent is not commonly known by the disputed domain name and Complainant has not granted Respondent permission or license to use the VMI mark for any purpose. Respondent is not using the disputed domain name to make a bona fide offering of goods or services or for a legitimate non-commercial or fair use. Rather, Respondent is attempting to sell the <vmi.com> domain name for an amount in excess of out-of-pocket costs. In addition, Respondent fails to make an active use of the <vmi.com> domain name. The only use of the Domain Name has been to resolve to a website offering the Domain Name for sale for $99,995. Respondent has registered and uses the <vmi.com> domain name in bad faith. Respondent attempted to sell the disputed domain name to the Complainant through a broker from Sedo. In addition, Respondent has engaged in a pattern of bad faith registration. Further, Respondent fails to make an active use of the disputed domain name. Finally, Respondent registered the disputed domain name with actual knowledge of Complainant’s rights in the VMI mark. Respondent acknowledges that the trademark and the disputed domain name are considered identical for the purposes of the Policy. Respondent claims that the domain name was not registered in bad faith. Respondent’s acquisition of the <vmi.com> domain name was in good faith because VMI is a common acronym used by numerous companies around the world. Therefore, Respondent is entitled to sell the domain name for whatever price he deems appropriate. In fact, Respondent did not approach Complainant with an offer to sell; the Sedo broker who approached Complainant regarding the domain name did so on behalf of the previous owner, and did so before Respondent purchased the name. Further, Respondent is making an active use of the disputed domain name. In addition, Respondent purchased the disputed domain name on the open market without any awareness of the Complainant’s relatively unknown and local trademarks. Finally, Respondent claims that Complainant has engaged in reverse domain name hijacking. On July 12, 2018 Complainant filed an Additional Submission acknowledging, based on the timeline that Respondent presented, that the offer to sell appeared to have been made by a broker operating for the former owner rather than the current owner. Complainant nevertheless maintained that Respondent has registered the domain name in bad faith because Respondent acquired it for the purpose of selling it to the owner of a trademark identical to that domain for valuable consideration in excess of documented out-of-pocket costs directly related to the domain name—is expressly listed as evidence of registration and use in bad faith. 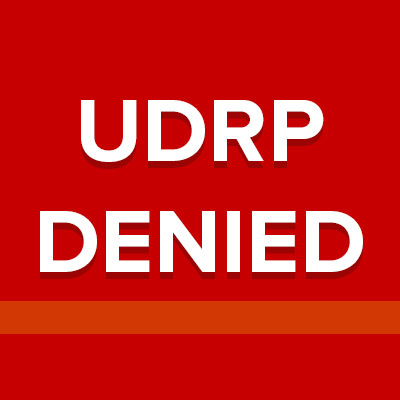 UDRP Policy 4(b)(i). Complainant notes that, as part of the acquisition of the Domain Name, the Respondent was told by the prior registrant of efforts to sell the Domain Name to other companies that might be interested in it because of its brand value. The prior registrant specifically mentioned an unnamed Danish company, but did not specifically mention Complainant. On July 16, 2018 Respondent filed an Additional Submission arguing against the acceptance of Complainant’s additional submission and in the alternative submitting a request to file an additional submission responding to Complainant’s additional submission. Because the Respondent requested a finding of reverse domain name hijacking, and because the Respondent included facts in its Response as to the timing of Respondent’s acquisition of the Domain Name that may not have been apparent to the Complainant, the Panel accepts the Complainant’s supplemental submission. If the Panel was considering ruling for the Complainant, the Panel would have granted Respondent the opportunity to respond, but because the Panel has decided to rule for the Respondent, there is no reason to further prolong this matter with additional submissions..
1. Complainant is a United States company engaged in manufacturer of wheelchair- accessible vehicles. 2. Complainant has established its trademark rights to the VMI mark by virtue of its registration of the mark with the United States Patent Office (“USPTO”) (e.g. Reg. No. 4,641,140, registered on Nov. 18, 2014), with a claimed first use date of 1998. 3. Because of the Panel’s ruling on bad faith, the Panel declines to consider whether Respondent has rights and legitimate interests to the Domain Name. 4. There is no evidence of registration or use of the Domain Name in bad faith. Complainant claims rights in the VMI mark based upon its registration with the USPTO (e.g., Reg. No. 4,641,140, registered Nov. 18, 2014, filed Apr. 17, 2014). See Amend. Compl. Annex B. Registration with USPTO is sufficient to establish rights in a mark pursuant to Policy ¶ 4(a)(i), and such rights date back to the earlier of the filing date of the mark or the date of first use in commerce. See Haas Automation, Inc. v. Jim Fraser, FA 1627211 (Forum Aug. 4, 2015) (finding that Complainant’s USPTO registrations for the HAAS mark sufficiently demonstrate its rights in the mark under Policy ¶ 4(a)(i)). Therefore, the Panel finds that Complainant has rights in the VMI mark per Policy ¶ 4(a)(i). Complainant asserts that the <vmi.com> domain name is identical to the VMI mark as it contains the mark in its entirety and adds the gTLD “.com.” Panels have consistently found that they may disregard the gTLD in determining whether the disputed domain name is identical or confusingly similar (though in some cases, the gTLD may be relevant to that determination). The Panel agrees with Complainant that, for purposes of the Policy, the <vmi.com> Domain Name is identical to Complainant’s VMI mark. As noted above, because the Panel finds that Complainant has failed to prove that Respondent registered and used the Domain Name in bad faith, the Panel need not consider whether Respondent has rights or legitimate interests in the Domain Name. The Panel finds that Complainant failed to meet the burden of proof of bad faith registration and use under Policy ¶ 4(a)(iii). The only allegation in the Complaint that could possibly support a finding of bad faith registration and use is Complainant’s allegation that a broker, representing the Respondent, reached out to the Complainant and offered to sell the Domain Name to the Complainant given that the Domain Name is the same as the abbreviation of the Complainant’s company name. See Amend. Compl. Annex K. If these facts were true, they would be powerful evidence of bad faith. As the Respondent pointed out in its Response, though, that offer was made by email dated February 6, 2018. The Respondent acquired the Domain Name on February 9, 2018, three days later. It therefore appears that, in the days leading up to the former registrant’s sale of the Domain Name to the Respondent, the former registrant was trying to see if it could obtain a higher offer. Having been unsuccessful, the former registrant apparently proceeded with the sale of the Domain Name to the Respondent. Complainant, in its supplemental submission, accepts this explanation and conceded that the offer was apparently made by the former registrant. There is no question but that the former registrant’s offer of sale constituted bad faith use of the Domain Name. Complainant argues that this bad faith should taint the Respondent as well, and asserts that the Respondent must have known of the prior registrant’s actions. Complainant has not submitted any evidence that can support such a finding. It is possible that the Complainant could develop such evidence in discovery, where it to file suit against the prior registrant or the Respondent, but Complainant has not provided any such evidence to this Panel and therefore the Panel is constrained to find that the February 6, 2018 offer of sale is irrelevant to whether the Respondent registered and used the Domain Name in bad faith. When this incident is disregarded, there is nothing left in the Complaint that can support a finding of bad faith registration and use. Complainant provides no evidence whatsoever that its VMI trademark was well known, or that Respondent must have been aware of it at the time Respondent acquired the Domain Name. For his part, the Respondent denies having been aware of the Complainant’s trademark, and on this record, that denial appears credible. Complainant also argues that the fact that Respondent is offering to sell the Domain Name for $99,995 is itself evidence of bad faith registration and use. The Panel does not agree. Complainant has adduced no evidence that Respondent’s offer to sell the Domain Name is intended to target the Complainant, or any other trademark owner. It is axiomatic that bad faith can only be shown if the Respondent is acting in bad faith with respect to the Complainant’s trademark. See Franklin Mint Fed. Credit Union v. GNO, Inc., FA 860527 (Forum Mar. 9, 2007) (“The Respondent’s interest in registering short domain names is not targeted toward trade or service mark owners. Specifically, what the Respondent’s pattern of domain name registrations clearly shows is that its registration of this domain name was not motivated by any intent – which the Policy requires – directed toward the Complainant.”). Rather, Respondent has indicated that it seeks to sell this Domain Name because short, three-letter domain names are perceived as being valuable. If the value of this Domain Name were clearly tied to the value of Complainant’s trademark the offer to sell might well constitute bad faith use, but here, there is no evidence that would support such a conclusion. Respondent has requested a finding of reverse domain name hijacking. Although the Panel finds that the Complaint was exceedingly thin, and the Complainant’s shifting arguments in its additional submission are troubling, the Panel declines to award reverse domain name hijacking here. The fact that a domain name broker who purported to represent the Respondent specifically offered to sell the Domain Name to the Complainant certainly was sufficient to raise concerns of cybersquatting. It is true that the Respondent here was not the guilty party, as the offer was made by the prior registrant, but that fact may not have been readily apparent to the Complainant at the time it filed the Complaint since the prior registrant sold the Domain Name to the Respondent three days after the broker’s offer of sale. The more difficult question is whether the Complainant should have proceeded with this case after learning of this timing issue, in the Response. Rather than drop the case at that point, the Complainant submitted a supplemental submission that continued to argue that Respondent was nevertheless violating the Policy. That supplemental submission was devoid of any facts that could support a finding of bad faith. Nevertheless, because the Complainant appears to have been left with a concern that the prior registrant and the Respondent were collaborating somehow, Complainant’s desire to press ahead with the case was not so unreasonable as to support a finding of reverse domain name hijacking. Having not established all three elements required under the ICANN Policy, the Panel concludes that relief shall be DENIED. Accordingly, it is Ordered that the <vmi.com> domain name REMAIN WITH Respondent.